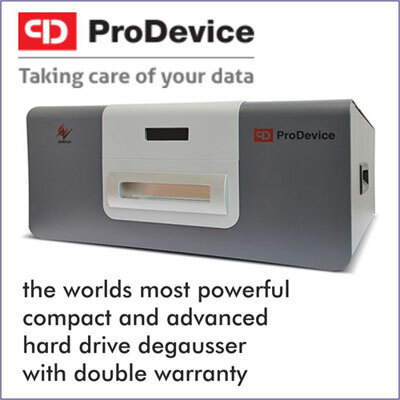 Modern, Advanced and high tech degausser from Pro Device is your guaranteed solution for complete deletion of data on hard drives, it’s the right choice. Do you have hard drives for data erasure? But don’t need a big heavy duty degausser, then the PRO DEVICE is the machine for you, it sits elegantly on your table, looks smart and is a real eye catcher in the office. Well it just doesn’t have good looks, you’ll be surprised by its power full 11000 gauss erasing field, good for latest loaded current hard drives and good for many years down the line. Best of all is the economical price and extended warranty. Just call us and you’ll get a world class product at a fantastic price. A degausser is a device that produces an enormous electrical charge that creates an erasing field that permanently destroys all information stored on magnetic media such as hard drive disks and back up tapes (cassettes) ; used in laptops, computer systems, photocopiers and printers. The magnetic storage of media uses different patterns of magnetisation to store information on the recording medium of video and audio cassette storage and back up tapes, hard drive/floppy disk platters and magnetic strips on credit cards. The powerfull PRO DEVICE degausser ensures that the information is completely wiped and is no longer retrievable. This is a modern, efficient and clean way to destroy all data on hard drives. Widely used throughout the world this hi tech electrical device is now increasingly used by Indian Banks and private companies because of its effectiveness and complete guarantee that all data will be deleted irrevocably. A standard hard drive holds 50 million sheets of A4 sized papers, guess you already must be using a paper shredder then what about you’re hard drives? Hard drives are of course in all computers and some photocopier machines too! SASCO offers a very advanced solution – the PRO DEVICE AMS120 - 11000 Gauss power degaussing machine. This degausser is made to the highest standard with all international safety compliances and comes with a software that records the details of degaussing. Since 2010, we’ve been delivering high standard products, prompt and personalized services and continuously updating and developing IT products that serve our customers’ needs adequately as time advances. Today, along with the best paper shredder we sell a complete range of tape and hard drive degaussers and physical hard drive destroyer and hard drive shredder that ensures your complete data security. Thorough 100% sure – Eliminates all data from your media, keeping you safe from potential security breaches and legal complications, no software in the world is going to be able to retrieve the data as the drive is not going to be there at all. Easy Just press a button! – Requires nothing more than a simple plug. Takes just a few seconds to know how to operate it and provide you with destroyed media and a complete report on paper. Versatile as advanced as it can get – Offers the most modern, silent and complete solution for destroying solid-state media and erasing data from laptop, desktop and network (server) hard drives, including drives that are damaged and/or not functioning. Cost Effective fantastic price of course invaluable compared to the data security it provides – Provides the most secure data elimination for a fraction of the cost of other methods. The device is priced very competitively and value received in just a few months, the quality is so good that you’ll be using it for years! The PRO DEVICE is an ideal degausser for offices efficient and fast for erasing laptop, desktop, and network (server) high-coercivity magnetic drives up to 1.5 inches high, as well as the full range of tape cartridge media—with no adapters needed. It’s also very easy to use and only takes less than 30 seconds to eliminate the entire data irrevocably for good.